Hi everyone! Stormy Smith here. My debut novel – Bound by Duty – released on July 24 and I’m here to give you some insider information on me and the book. 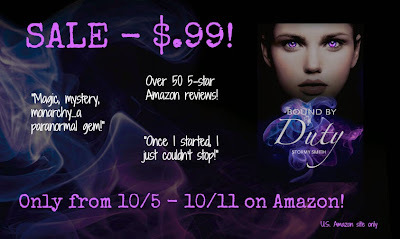 Synopsis for Bound by Duty: Amelia grew up in a world of half-truths. She knows she's an Elder, but has no idea what that means. Her father reminds her daily that she must maintain control, but he refuses to explain why. Even worse, she's betrothed to the prince of the Immortals and doesn't even know his name. I love the songs associated with the book. NICE!! !